Really. Very. Brilliant. Then really again. Over and over and over, sometimes three or four times on a page, for two or three pages. In my case, my mind will find a word and repeat it. The usage is always appropriate, but using “really” six times on one page is not good. That is, unless you have a character with a verbal tic, or you are deliberately emphasizing something for a reason, like foreshadowing. The first time, it was “very.” Thanks be, Nas Hedron, super-editor, caught the problem. Rather than try to fix it all himself, as he was doing with other copy-edit things, he just flagged every usage and sent the manuscript back with a note recommending that I change or remove most of them. Having to go through and do it myself really opened my eyes to the problem. So what do you do? First, if you are a brand new author, I strongly recommend hiring a good editor for your first book. If you can find someone like Nas, who can catch tics and bring them to your attention, he or she is worth every penny you pay and then some. You probably don’t even realize that you are doing it. Since I know that I have a tendency to repeat a word to death, I keep an eye open during the review/revise phase of writing. Most recently, I started to get a sense that “really” was appearing a little too often. Nine times in two pages is really too much, I’m sure you’ll agree. So I went up to that little box on Word and did a “Find all.” The manuscript looked as if someone had splattered egg all over it (yellow highlights). Yes, I really had a problem. I removed about half the “really”s, replaced another quarter with a different intensifier, and left the rest, so long as there were no others in close proximity. You might not repeat words the way I do. You might fall into the Tom Swifty trap (“Run faster,” said Tom hurriedly.) You might go through a phase where you write so fast that you omit dialogue tags [guilty] and then have to figure out who said what to whom for two pages and more. You might—gasp!—overuse punctuation—no! Really? I remember one fantasy novel where it reached the point that if the heroine “played with the end of her long, soft curl” one more time, the book was going to go flying. One page later, it flew. Does this mean your characters can’t have a repetitive action unless you are showing that they are OCD, like Monk? No. Auriga “Rigi” Bernardi giggles a great deal. But she knows this, tries not to do it, thinks adults don’t giggle, and so on. It is part of her personality that bubbles out. 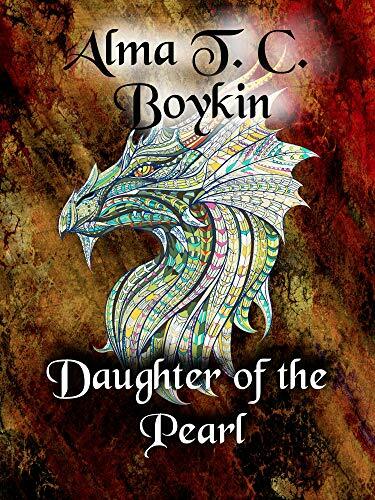 Edited to add: For those looking for a book about dragons, and a wild river, and magic, Daughter of the Pearl is now available. ← Has KULL Killed My Sales? Yep – “find all” is an excellent way to catch those overused words. I thought that with my third novel the copy edits would be fewer in number. Probably means something, but damned if I know. I totally do this. I’ll use a word three times in a paragraph, then have to go back and fix it after I get to the next paragraph. Which makes the writing slow, one paragraph forward and two back. Just like that. So I’m getting good at thesaurusing. Which, by the way, is totally a verb. And I just used “totally” three times. This is true when I speak, and is probably also true for my writing. I do it in speaking, as well, and in written communication. Just to bring something to the MGC people’s attention. I don’t know if the issue stems from my end or your end. Other WordPress sites I follow don’t do this. (Sarah’s and some other folks personal blogs.) In case there is something from your end behind it, I thought I’d let you know. I noticed it in my first novel. “Just” showed up a lot. Strangely, I had a hard time taking them all out. They seemed very meaningful at the time, each and every one of them. Most writers seem to have a set of special phrases they like a lot. The Expanse books use “companionable silence” two or three times per book, I think. This is really obvious if you read a book in a foreign language. That odd phase you looked up turns out to be useful several times. It makes it easier to keep reading books by the same person–and a little upsetting to switch to a new author and discover how much harder it gets. I caught a character thinking the same phrase four times in the book I’m formatting. After some consideration I left it, because it shows how ingrained an idea is in him, and what a wrench it will be when he has to admit that perhaps he is wrong about something. I’m not certain if there will be another book in that world, but if there is, that “pet phrase” will probably reappear. This wouldn’t happen to be a new shinigami detective novel by any chance? No. It’s a fantasy set in a world like Song Dynasty China, entitled Daughter of the Pearl. Just went live this AM. I make a point of spotting Timothy Zahn’s ticks when I read him,” he said dryly, eyebrow twitching microscopically. And there’s one whose characters all Said Quietly so often (and with so little meaning) that if I ever reread ’em, first they’re going into the edit mill, and it’s wholesale death to every durn one of ’em. Greg. Interesting point. Never thought of that. English is very foreign to me, but overuse of the same word or phrase is something that I really notice and dislike. However, I find some authors like Eddings, Ringo and Weber very easy to read. All of them have dozens of books out, mainly in long series, so I probably read enough of them to make them easy by familiarity. I recently took to listening to the computer voice read my stuff. Oh ouchies! On my Mac, it treats “th” words as interchangable, and worse, “the” and “a” are as well. Still I found more mistakes than I’m comfortable with, The worst thing is the computer badly mangles the word “grimace.” And I found I’ve been using it sometimes, two or three times a page. The dictionary has distressing few synonyms and mostly poor ones. Made a face isn’t the same thing, scowl is a word you can use a few times. I’m a writer, I invent things. This one is tougher than most tics. I do lean on the thesaurus function in Word, as well as a print version. Dictionaries can help but a thesaurus offers more options, even the limited free on-line versions. Way better’n a thesaurus, since it does Shades of Meaning. I like the black-jacketed hardback edition. Also, TheSage is useful as a slightly different word-chaser. Eats very little and works as a popup with any application. Current version is free, or get the next version sooner for a small fee. On a totally unrelated note: Sarah won the Dragon Award! A cheering populace takes to the streets! Way to go Sarah! Woo Hoo! Viet? or …ress? Rats, either way. I like “dancing rodents” (i.e., conga rats) myself. Azure, there’s a reason the phrase WordPress Delenda Est was coined a few years ago. Even the overall moderators like Amanda Green can’t tell you why you can be an approved commentor for months or years, and then get tossed into moderation. I know having multiple outside internet links always does it, but beyond that? WordPress is a technical entity, involving technical devices (computing machinery) and as such attracts attention of creatures that are… what’s the biological equivalent?… parasitic, one might say. That is: Beware Gremlins. Many possible explanations: You used a word or phrase that was identified by a filter as potentially spammy or potentially inflammatory, or by another filter as being a potential database attack, or because it’s [Select Day of Week].